As usual there were elements of the design that were a trifle perplexing, not least of which were the four the side panels. These have to be made from shoji paper (a translucent material) which tears quite easily...so how then to remove a panel easily so that the offending torn section could be replaced? I'm not sure how it's done in proper lamps, but I've decided to use rare earth magnets with four to each panel. 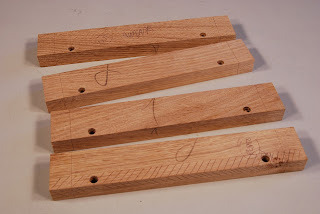 The pic shows some of the rails, with a section cross-hatched, one piece of which will form a quarter of a panel. The rebate sits on the outside of the carcase and the frames then fit into the rebates...the holes that can be seen are for the rare earth magnets, as it's much easier to mark out and drill before the timber's been machined away. Sounds complicated?...not really. The whole piece is fairly simple with straight forward m/t joinery and the only curvy bits in it (and I like curvy bits) will be in the handle. There are though, one or two interesting features of this little project that will be further elaborated on as I make it...so watch this space! 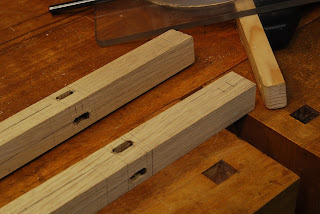 The second pic shows two of the four stiles with the mortises cut as I always do them...with a router. These have been left with round ends from the router bit and have yet to be squared out, an enjoyable half hour with small chisels. You can also just see the pencil marks for the long sections of the rebates which will eventually hold the shoji paper frames. More to come, provided I can find time 'twixt shredding a mountain of branches, digging out tree roots out and interminable trips to the dump.